In 1837, when the Melbourne city grid was conceived, Surveyor Robert Hoddle and Governor Bourke had a grand vision for the young city. The grid was enormous – much larger than it needed to be for the population of around 4000 people. I staked the main streets ninety-nine feet wide, and after having done so, I was ordered by the Governor to make them sixty-six feet wide; but upon my urging the Governor, and convincing him that wide streets were advantageous on the score of health, and convenience to the future city of Victoria, he consented to let me have my will. I therefore gave up my objection to the narrow lanes thirty-three feet wide. Finn, E 1888, The Chronicles of Early Melbourne, centennial edition 1976, Vols 1–3, Heritage Publications, Melbourne Vic. Robert Hoddle's original surveyor's chain is held in the State Library of Victoria's Pictures collection. Although it's no longer used as a unit of length, a cricket pitch is still one 'chain' long. These lanes caused some of the grid's first problems. As the population grew and land was subdivided, the laneways – designed to give access to two or three houses – needed to service ten or more houses. They became poorly lit public urinals, rubbish tips and breeding grounds for criminals. Another problem was that when Hoddle planned the grid, he ignored the existing physical landscape and the homes of people already living in the settlement. Some people found that after Hoddle's survey, their house was in the middle of a major street. One dry morning, while I was waiting my turn for letters at the Post Office on a mail day, I was startled by seeing a great tidal wave rolling along Elizabeth Street [...] I got up the ornamental base of one of the pillars and clung there, with the water dashing over my waist, while some less fortunate ones were swept away. Brown-May, A 1998, Melbourne street life: the itinerary of our days, Australian Scholarly Publishing, Kew, Vic. This quote is taken from a secondary source which looks at social history, a discipline that uses newspapers, images, letters and diaries to study the lives of everyday people. Despite its problems, the grid became an iconic feature of the city of Melbourne. 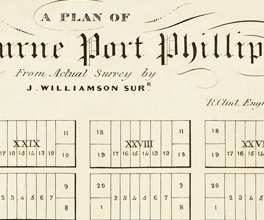 Hoddle's vision of wide streets and simple geometry may have been unpopular in 1837, but his grid is still a symbol of settlers' grand ambitions for Melbourne.